Turning Men's Hearts Back Again! In June, we will be hosting our annual Men’s Christian Camp and Get-Away in the Mt Melleray Scout Centre in Cappoquinn, Co. Waterford! Men are invited to make plans to come and be thoroughly encouraged! It runs from Wednesday afternoon June 17th, until Saturday June 20th at Lunch. The meeting is just before Father’s Day, and will focus on men’s hearts being turned back to God, to their families, and to servanthood! There will be outdoor activities like no other, and the preaching will change lives! This is an opportunity to spend time with 70 or more other men who love God and want to live for Him in this dark and troublesome time! All the messages will be about how Elijah faced down the culture of his day, and turned the hearts of a nation back to God! All men today need this meeting! 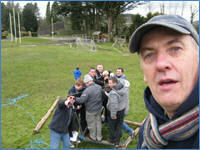 Men's Camp is held in Mount Melleray Scout Activity and Sport Centre, Cappoquin, Co. Waterford. The cost is €75 per adult, €45 for under 14. 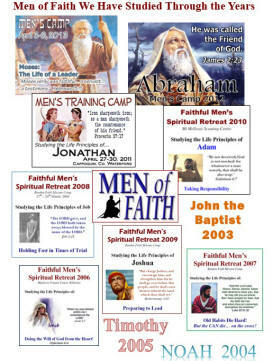 This Men’s Camp is open to all men and their sons from age 6 upwards. You need to tell your pastor that you are planning to come, and prepay €20 to book your place. The balance is due upon arrival! 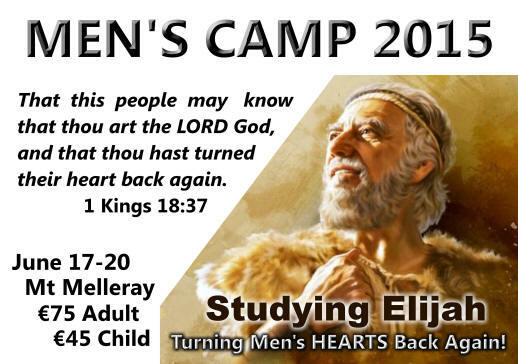 The Ireland Men’s Christian Camp attracts young and old from all over Ireland and Europe! Baptist Pastors, Missionaries, Soul-Winners, Sunday School Teachers, Song Leaders, Husbands, Dads, Teens and Boys… all gather together to get transformed by the strong preaching of Biblical truths across just three days away in Co. Waterford! Plan now to attend this life-changing event that includes great Christian fellowship, tremendous preaching, awesome singing, powerful prayer times, fun activities, and great food! Weather permitting, there will be hiking, sports and some surprise events! Bring your Bible, a sleeping bag, and come hungry for God to change you! The three days away at this kind of a Camp allows God to work on our hard hearts through the preaching and teaching of His word! Don’t miss a single minute of this Camp! There is room for 100 people, but booking is first-come-first-serve. So, make plans and contact Pastor Craig Ledbetter as soon as you can, letting him whether you and your church are coming and when you plan on arriving. Let’s reach out this year and bring a friend along with you! Teens, and even younger boys are encouraged to come as long as their father is with them, or as along as their Pastor agrees to take responsibility for them. Please pray about being able to come, and let us know soon! 8. Costs are based on how many nights you can stay, and therefore how much FOOD each person eats. So, plan on €75 (IT IS WORTH EVERY PENNY) per person. That pays for the meals, and the use of the rooms and facilities that we use for the meetings. Kids under 14 will just cost €45 each. If you can only come for one or two nights, then we can adjust the price. WHAT TO DO NOW. Contact Pastor Craig Ledbetter and tell him you are coming, how many will be with you, and when you plan on arriving. If you have any questions, or need directions, contact us! But remember, this is on a first come first serve basis so… LET US KNOW SOON! See you there!